Shrews are often confused with mice, but a close look reveals some distinct differences. Shrews have long pointed noses, dense velvety fur, and black beady eyes. They have five toes on all feet while most mice have only four toes on their front feet. Shrews also carry an odor so vile that it keeps most mammalian predators from eating them. Because of their extraordinarily fast metabolic rate (heartbeat of the masked shrew has been recorded at 1200 times per minute), shrews must feed voraciously, night and day. They eat insects, earthworms, and even small mammals. Shrews have tiny, but very sharp teeth which they can use to bite and tear flesh. One biologist found the remains of several jumping mice which had fallen into a hole while still alive. Shorttail shrews had eaten the mice, leaving only the skins turned inside-out. The poisonous saliva of the short-tail shrew probably aids in subduing mice. A biologist reported a shrew bite which produced painful swelling for several days. Shrews are the smallest of Minnesota mammals. The pygmy shrew, with a body length of about two inches, weighs only one-eight ounce, hardly more than a dime. The short-tail shrew, our largest shrew, weighs about one-half to three-fourths ounce. Both species are found throughout the state along with the masked shrew, whose range extends across the northern U.S. and most of Canada. 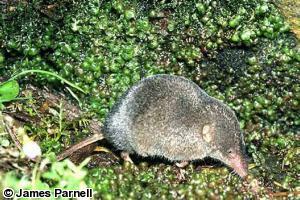 It is probably the most common member of the shrew family. Most shrews are drab. The Arctic shrew, however, is distinctive with its dark brown back, lighter brown sides, and off-white underparts. It lives over much of Minnesota, except the southern tier of counties. The least shrew (pictured left) is found in one or two southeast counties, but only rarely. 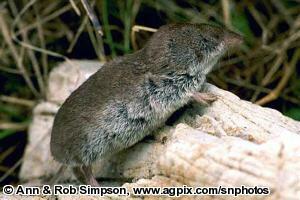 The northern water shrew is "large", up to one-half ounce, and about six inches long, though half its length is tail. As the water shrew swims, it seems to run over the water. It is also an excellent diver. This shrew thrives along meadow streams and bogs of the northern three-fourths of the state. A rare shrew in Minnesota is the smoky shrew (first picture).